I came across a great article on UXBooth this week titled, “The UX Chameleon and Its Multidisciplinary Skin” by Fabricio Teixeira. It’s a well-written piece discussing all the phases that UX pros should be part of in an agency’s development process. There may be multiple answers to a solution. Lay out as many variations as possible to uncover the ideal solution for the project. The only part of Mr. Teixeira’s article I disagree with is the notion that paper sketches save time because they “feel more collaborative” and are easy to edit. First, I don’t know how rough lines on paper – or even straight lines on a computer – can “feel” more collaborative. It feels collaborative when you know it was worked on by more than one person. Second, in my experience, yes, paper sketching is easy for the first couple of passes. However, if you are really collaborating with others on your sketches, you will either end up with incomprehensible scribbles on the piece of paper or you’ll end up with a ton of wasted paper that also includes items that you repeatedly draw over and over. I find an initial paper sketch to be great. It let’s my brain work freely through my hand with a pen and onto paper – a process that can be magical. But after the first pass, I find it easiest and more efficient to transfer my sketches to computer (and, of course, ProtoShare specifically). This allows me to quickly make changes, even with the ability to preserve versions, and not have to re-sketch elements over and over again. 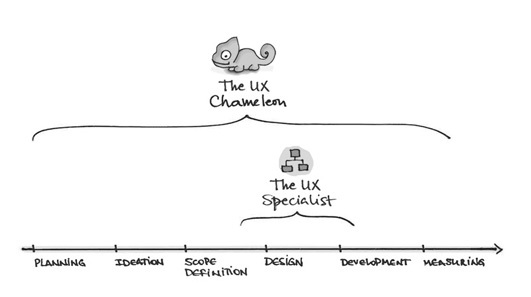 What do you think about being a UX chameleon on your team? Are there key aspects of Fabricio Teixeira’s article that you strongly agree or disagree with? Previous post: A New ProtoShare is Released!